I stopped in the store last week to make a return so decided to try on some of the new arrivals – mostly to get an idea for fit. I had a few out of the gate fall arrival purchases but for the most part, am fine to wait until the price drops on many of the fall items before I decide to purchase anything. 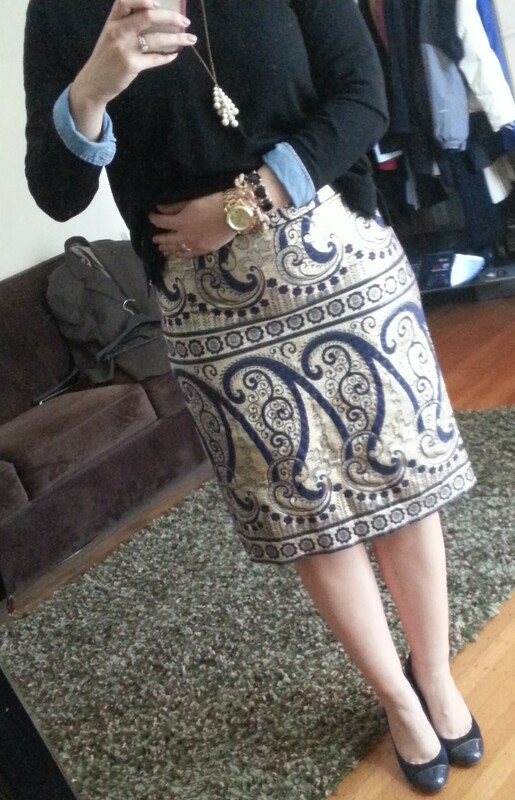 First up is actually an item I ordered online – my top pick from the early fall rollout; the J.Crew Gilded Paisley Collection Pencil Skirt. I was worried about this pencil skirt being stiff, so I sized up to a 14 to be on the safe side. It was backordered for several weeks but recently received it and it was perfect out of the package. It’s on the longer side – the site states it is 25 1/2 inches long which is the length of the long No. 2 pencil skirts. I tried it on with the top half of the outfit I was wearing that day but I think I might actually dress it down like this with a chambray shirt and black sweater. I do have a little extra room in the skirt but I’ll probably keep this size. If you don’t have a lot of hips, etc. you could probably stick with your regular size. First up, was the J.Crew Turner Pants in Black and also the Turner Pants in Hidden Floral. 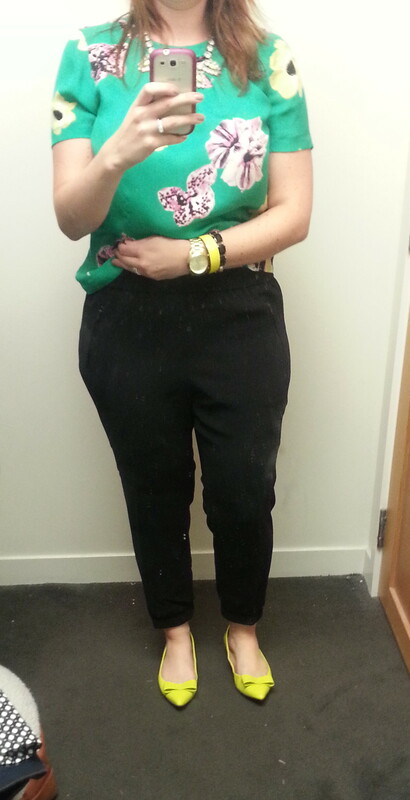 I’ve tried a few of the drapey silky pants and they’ve been a total disaster…not for girls with hips. So I was curious to try these which look to be a little more structured. My store only had a size run up to a 12 so I tried the 12 in both sizes. The next time I go and try clothes on at J.Crew, I’m bringing some glass cleaner and a rag because these mirrors were SO dirty. The pants were cute, kind of glorified sweapants. The banded ankles will take some getting used to, but styled properly and with a pair of heels I think I could attempt to pull these off. I would have liked them a tad looser but I fear that sizing up one would just look sloppy. I think for girls with not as much junk in the trunk as me would be fine with their regular size. Ann Taylor has their own drapey pant version (sans zipper detail) and they were 50% off over the weekend so I decided to order these to try them out since I’m still on the fence about these. When pattern mixing goes wrong…haha. These are the J.Crew Turner Pants in Hidden Floral. I’ve liked these on others but not so much on me. They just scream, look at me, I have hips! If I’m indulging in this drapey pant trend, then it would appear I’m doing so in a darker non-patterned fashion. Next up is an item I’ve had my eye on since the initial rollout – the J.Crew Endless Shirt in Stripe. This comes in navy and burgundy stripe and also has a solid white version. Aside from the obvious gaping in my chest a,ea that can easily be fixed with a safety pin, I really love this shirt. I sized down to a 10 in this shirt and as soon as we get a full price promotion, I plan on purchasing the navy stripe and the white version. I am 5’8″ and it is a perfect length on me. The hem is split on the sides which nicely accommodates my hips and this will be a perfect shirt with my Pixie Pants, namely my leather front Pixie Pants. It’s tough to tell in this photo but I’m wearing the Reid jeans which were a surprise love for me. I in no way need a new pair of jeans but these were really comfortable – a bit long, but comfortable. Next up, the Marled Rib Stitch Cardigan in marled grey. This sweater comes in black as well and is 100% cotton. I saw this online and liked the shape and I really liked how it paired with the long button down shirt. However, at $110 for a cotton sweater, I’ll wait for this on sale. I also found the grey to be a bit scratchy, I didn’t try the black but I was told on Instagram that the black is a bit softer. Again, I think I would prefer this sweater in wool to get me through the winter. I do really like the shape of it. I took a medium in this sweater which is the smaller of my two letter sizes. 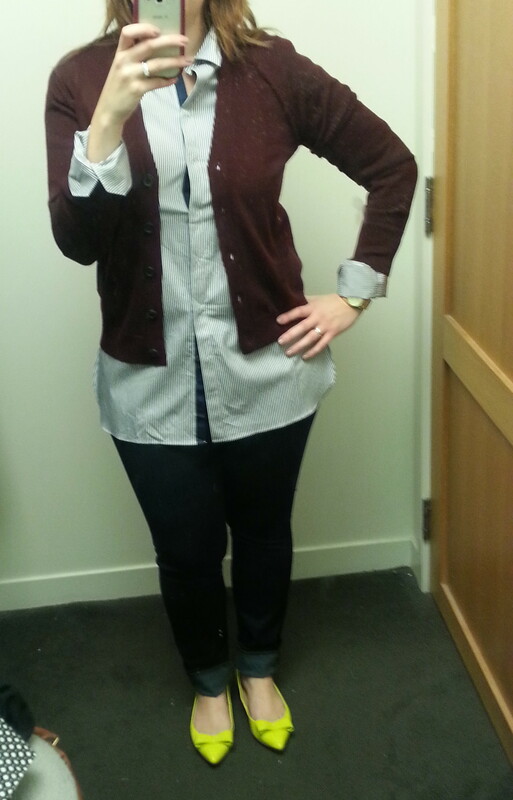 And another attempt at the long/short proportion play with the Merino Wool V-Neck Cardigan in Vintage Cabernet. This sweater screams high school uniform to me as I wore a maroon sweater for four years of Catholic High school but overall, I didn’t mind the shorter shape. 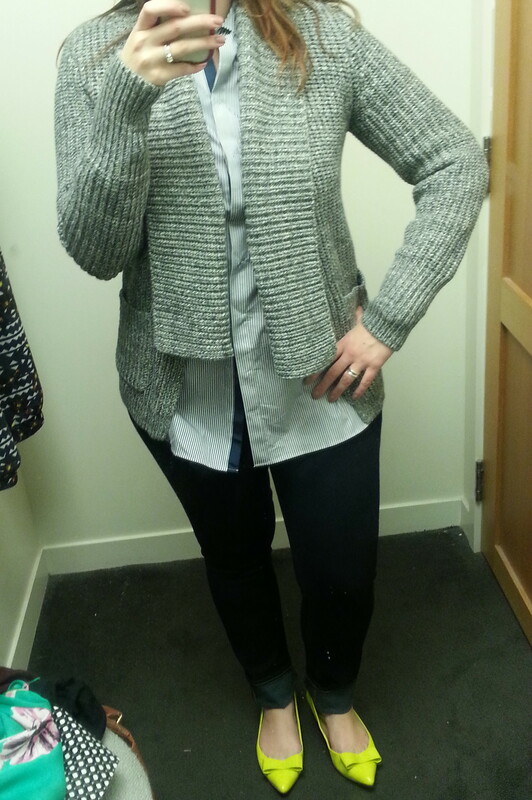 I’m not sure it’s the perfect fit with this shirt but it would be a nice change from all of my longer cardigans and I liked the heavier knit of the wool. 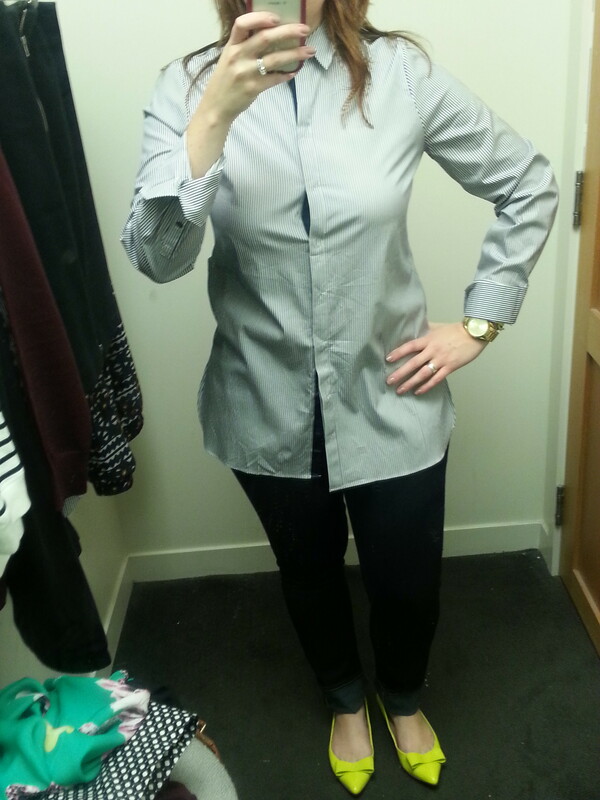 This is a large – the sleeves were a bit loose but I would probably size up to compensate for the shrunken style. So, there you have it, my latest in-store try-on session. Just in time for more new arrivals this week! I’m trying to get the most out of the rest of summer so am trying to limit the fall purchases for a little while longer. But I definitely have some new wishlisted items, including the jeans! What do you think? What are your favorite early fall items? Anything you’re not loving? Would love to hear what you think and thanks for visiting!